October is Manufacturing Month and October 7th is Manufacturing Day - Mark Your Calendar! Sarasota County schools are excited to celebrate career opportunities in Manufacturing with the help of FLATE, FloridaMakes by planning daily activities and another BIG year of student tours to local manufacturing facilities. Special thanks to several local companies/schools in providing student tours for Sarasota County schools including ASO LLC, KHS USA, PGT Industries, Sun Hydraulics, Super-Sensitive Musical String Co. and Black Diamond Strings, Teak Decking Systems and Suncoast Technical College. Per FLATE, our goal is to provide students with rich and meaningful career exploration experiences. 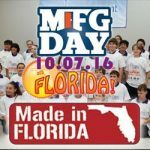 Manufacturing Day is a been a great way to bring national attention to the industry in our state that directly supports nearly 400,000 Floridians with high wage, high skill jobs and careers. It also has been a great way to bring parents and communities across Florida together to learn about the manufacturing industry and its huge impact on our state’s economy. 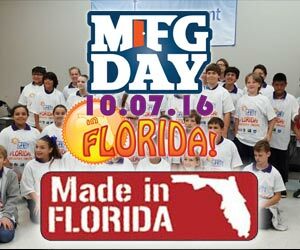 In 2016, FLATE is happy to partner with FloridaMakes who will be helping with our statewide MFGDAY-FL coordination. For more information about manufacturing activities, go to the CTE Resources drop down menu and look for Fun Facts, FLATE and FloridaMakes.